Anna Bolton | Greene County News Crew members work to set up the Antioch Shrine Circus tent April 2 at the Greene County Fairgrounds. Shows will be held Thursday-Sunday, April 4-7. 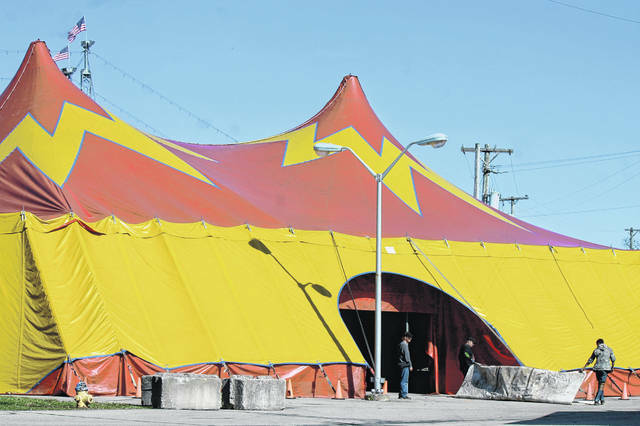 XENIA — Greene County Fairgrounds has a new look: a red and yellow Big Top. Antioch Shrine Circus will perform at 120 Fairground Road for the first time this Thursday-Sunday, April 4-7. Performances will take place 6:30 p.m. Thursday, April 4; 6:30 p.m. Friday, April 5; 10 a.m., 2 p.m. and 6:30 p.m. Saturday, April 6; 10 a.m., 2 p.m. and 6:30 p.m. Sunday, April 7. Circus Chairman Kevin Sweeney said this is the first year the entire circus will take place under a tent, as opposed to in an arena. In the past, the circus has been held at the Montgomery County Fairgrounds, Hara Arena and University of Dayton Arena. Acts will include elephants, horses, acrobats, aerialists, clowns and more, Sweeney said, including a motorbike act where multiple motorcyclists ride at the same time inside a globe. “It’s a big crowd-pleaser,” Sweeney said. This year’s event will be the Antioch Shrine’s 77th circus in the Dayton area and their second year partnering with The Tarzan Zerbini Circus. “There’s a lot of excitement and energy. It’s going to be a really good time,” Sweeney said. Tickets are $20 for General Admission (upper level, bleachers), $35 for VIP Seating (lower level, seats with backs) and $50 for Ringside Box Seats (first two rows, plush red velour seats). Children 3 and under sitting on an adult lap are admitted for free. Tickets can be purchased at www.antiochshrinecircus.com. Proceeds from the circus benefit Antioch Shrine Center Operations. For more information, call 877-730-CIRCUS (2472) or the Circus Office at 937-228-0052.
https://www.fairborndailyherald.com/wp-content/uploads/sites/50/2019/04/web1_Tent-1.jpgAnna Bolton | Greene County News Crew members work to set up the Antioch Shrine Circus tent April 2 at the Greene County Fairgrounds. Shows will be held Thursday-Sunday, April 4-7.